While we were parked one day, Dova decided to pose on the back deck of my car. Part of the reason I wanted a convertible was to feel the freedom of the wind in my hair. I love throwing my arms up in the air while I'm driving. But sitting on the back deck reminds me off two movies with awesome convertible scenes. First Terms of Endearment with Jack Nicholson. I didn't care for the movie, but there is one scene I love where Jack is driving on the beach, sitting on the roof of a 1978 Corvette, steering with his feet. Image from Alert the Media. "Wind in the hair. Lead in the pencil. Feet controlling the universe. Free love at the helm." The movie clip is awesome if you haven't seen it. And then there is Thelma and Louise. The movie would not be the same without the Thunderbird convertible. I will not be trying either of these stunts with my car! If I had a convertible, I'd be sitting back there, too! How fun! I envision her in a parade like that! She looks so happy up there! Just wait until she turns 16. Great pictures, she looks so carefree! What a cute little model she is! I love the glasses, but then again I am partial lol. Stopping by to follow you for wordless Wednesday. Please visit me when you get the chance. 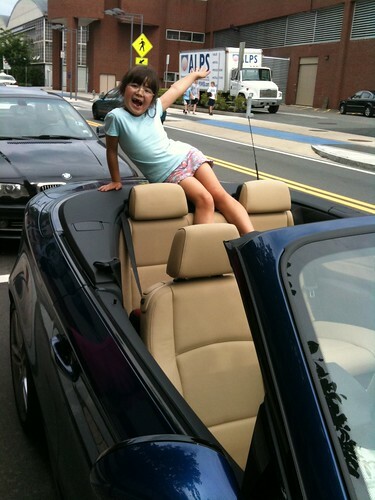 I remembered that you wanted a convertable BMW 10 years ago. You got it 10 years later. 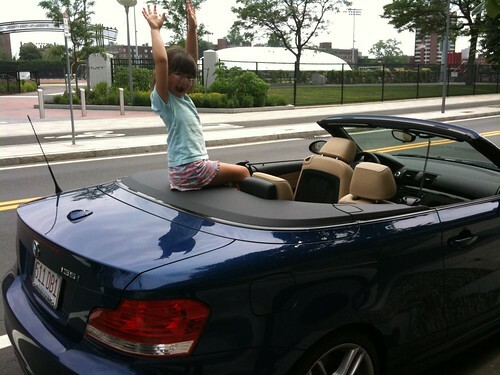 I thought Adam would like to jump in and out of your convertable and feel great that Mom got a convertable! !